A vineyard in Michigan near Grand Traverse Bay. Photo credit: iStock. Ask someone 20 years ago about American wine, and your answer likely would have highlighted California wines. Ask the same question 10 years ago, and you may have seen a few nods to Washington and Oregon as well. But today, American wine has started to take on a different shape. 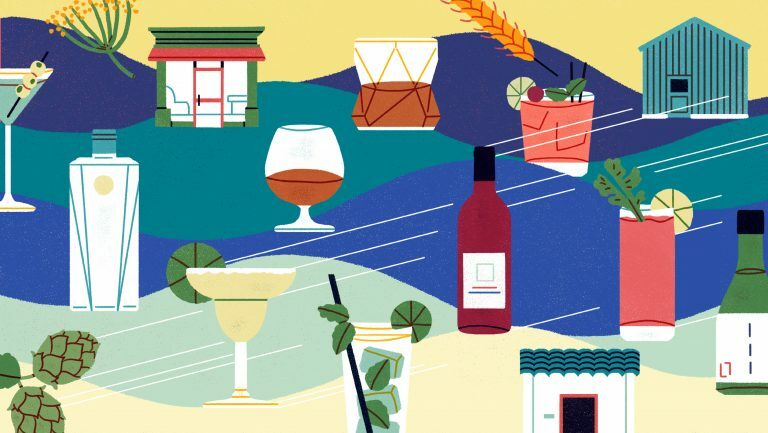 While California, Washington, and Oregon continue leading in both sales and overall familiarity, an exponential increase in wine production and vineyard plantings in New York, Virginia, Pennsylvania, Michigan, and beyond has started to paint a more definitive picture of the future of American wine. It’s a phenomenon that no doubt spurred the writing of a range of books, from the more academic American Wine by Jancis Robinson and Linda Murphy to the more comedic American Wino by Dan Dunn. And why not? As Master Sommelier Wayne Belding sees it, it’s about time some of the country’s developing wine regions get a little attention. Based in Colorado, Belding has spent the better part of his wine career judging competitions such as the Mid-American Wine Competition in Iowa and the TEXSOM International Wine Competition in Texas, where he’s evaluated wines from just about every corner of the country. “It’s been rewarding growing up in the trade for the past couple of decades and seeing wineries pop up in a vast number of places where you’d never imagine they’d be 50 years ago,” says Belding. Indeed, right under our noses, there is a groundswell of small and not-so-small boutique producers popping up who are revealing the vast terroirs of this continent. Covering Texas wine for Texas Monthly magazine for the past decade, I’ve had a bird’s-eye view of the evolution of a nascent industry as it comes into its own. Last summer, I drove through the Texas High Plains AVA and spent time with a few prominent grapegrowers there. The AVA is not located among steep mountain slopes, or even rolling hills. Instead, it’s located in the Panhandle of the state, right in the heart of the Llano Estacado, one of the largest flat mesas in North America. With elevations between 3,000 and 5,000 feet, the land is arid and windswept, with dust kicked up from the red alkaline-rich caliche soils that cover a subsoil high in calcium not a few feet beneath it. You won’t find a single rise, rock formation, or tree for miles. Instead, you’re more likely to get lost in the sea of cotton, peanut, and row-crop fields that paint the landscape—and on occasion, you’ll see a flourish of vineyards. It’s a fitting environment for tumbleweeds and oil derricks, but vineyards? Many experts would take one look at this dusty, flat region and conclude that it’s not ideal for cultivating vines. But tell that to the three dozen grapegrowers managing a few thousand acres of vineyard here. 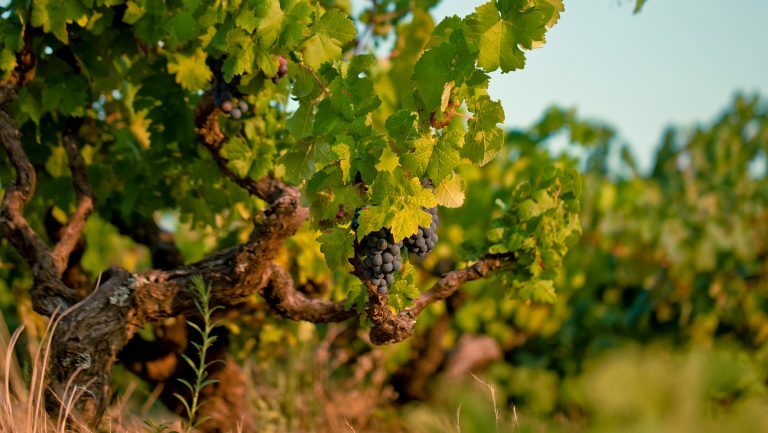 Vineyard plantings in Texas date back to the mid-1600s, when the Franciscan monks settled their missions. More arrived with European settlement through the 1800s. But the modern Texas wine story began in the late 1960s, when a couple of researchers, Bob Reed and Clinton “Doc” McPherson at Texas Tech University, planted a few vines based on a hunch. (McPherson planted Sangiovese vines, and his Sagmor Vineyard is still around today.) Other Texas wine pioneers jumped into the game, following in the footsteps of California with primarily Bordeaux varietals. While there were a few blips of success with national awards and a growing interest among Texas wine consumers, many would argue that the defining era of Texas wine is right now, based on a previous decade of focus and refinement from a growing league of winegrowers and producers. The state ranks 11th in overall wine production, according to a 2016 report from the Alcohol and Tobacco Tax and Trade Bureau (TTB). Among its eight AVAs, the Texas Hill Country is second to the High Plains in grapegrowing and encompasses about nine million acres of rolling hills in Central Texas. Here, elevations reach about 2,100 feet, and the soils vary from limestone and granite to clay and sandstone. Other AVAs include: Bell Mountain, the first in the state, situated entirely within the Texas Hill Country AVA; Fredericksburg in the Texas Hill Country AVA, with a large concentration of vineyards; Escondido Valley, in far West Texas near Fort Stockton; Mesilla Valley, on the western tip of the state near El Paso and shared with New Mexico; Texas Davis Mountains, known for its higher elevation between 4,500 and 8,300 feet in West Texas; and Texoma, near the Texas-Oklahoma border. Considering the wide range of growing conditions, the top growing challenges in Texas include hail, late spring frost, and late summer rains. But winegrowers have quickly worked to adapt to these conditions, taking notes on the lessons learned in other growing regions across the country, namely California and Washington. Among the state’s leading producers is Kim McPherson of McPherson Cellars. He took up the torch of his father, Doc McPherson, in the 1980s, working as the chief winemaker for some of the state’s larger producers, including Llano Estacado Winery and Cap*Rock Winery. In 2008, he opened his own winery in the heart of Lubbock, where he’s since solidified his place as a top Texas winemaker as well as a mentor to the growing generation of producers who came after him. His commitment to growing warm-climate grapes has helped pave a more prosperous path for the industry. Looking to Spain, Southern France, and the warmer parts of Italy, McPherson has had great success with Tempranillo, Mourvèdre, Roussanne, Marsanne, Albariño, and Viognier. Following his lead, other top producers including Duchman Family Winery, Pedernales Cellars, William Chris Vineyards, and Lewis Wines have enjoyed similar success, adding varieties such as Tannat, Touriga Nacional, Tinta Cão, Montepulciano, and Aglianico to the mix. “The sheer scope of opportunity Texas has right now is what makes it most exciting,” says Doug Lewis of Lewis Wines, who has been a champion of Tempranillo, Chenin Blanc, and Portuguese varieties. At the age of 31, Lewis is one of the younger producers to step onto the Texas wine scene. He and business partner Duncan McNabb opened their winery in 2010 with 600 cases. Today, they produce about 7,000 cases. Inspired by apprentice work at Pedernales Cellars and relationships with McPherson and others, Lewis was surrounded by quality winemaking in his early career, an advantage that has prevented him from making some of the mistakes of earlier generations of Texas winemaking. Striking a balance with acidity, pH, and ripeness is a challenge in Texas due to extreme heat, but those winemakers who have dialed in their processes are walking the tightrope more nimbly and would argue that this is simply one component of Texas terroir. Much of it means throwing conventional wisdom that may work in California out the window and paying attention to what vines experience in Texas soils. With an estimated 4,000 acres under vine and about 1.9 million gallons of wine produced each year, Texas’ large geographic footprint is significantly dwarfed by California’s wine production at 6.8 million gallons and more than 560,000 acres of vineyard plantings. Still, in the realm of wine industries across the country, Texas is a contender. Some would argue that the state’s greatest barrier to success is an overall industry commitment to making wines with Texas-grown fruit. Much of the Texas wine sold includes a percentage of wine made from out-of-state grapes. It’s a common practice among many states with smaller wine industries and falls within the TTB labeling guidelines, so long as the producer includes the phrase “For Sale in Texas Only” on the bottle if the wine includes less than 75% state-grown wine. But those who want to see Texas press forward feel the labeling laws need to be much more stringent. In the recent Texas legislative session, Texas producers battled it out over a bill that would raise the required proportion of Texas-grown grapes in an appellation wine from 75% to 100%. Those in favor of the bill believe a commitment to authenticity is the only way to put Texas wine on the map. “If we want to be taken seriously in the marketplace, we have to offer a product that is what it says it is. This is how California, Oregon, and Washington have solidified their success,” argues Lewis. But it was an overwhelming majority of producers who stood up against the proposed legislation, arguing that while grape quality is generally there, overall quantity is not sufficient to sustain their production demands. In short, they feel that Texas is not quite ready to take on the same standards as larger wine-producing states. The proposed bill didn’t make it out of a special committee for an official House vote, but the controversy it stirred up within the industry made it clear who believes the industry is ready to rely on Texas vineyards, and who does not. With the legislative session now closed, the matter is far from over, especially considering media attention that raised consumer awareness about the topic. But Texas isn’t the only state emerging from beneath the shadow of the leading US wine-producing states. Seventh in overall wine production, Michigan has nearly 200 producers on record and about 3,050 acres of wine vineyards. (The state also has more than 10,000 acres of table grape vineyards.) According to a report from the Michigan Grape and Wine Industry Council in 2017, the Michigan wine industry has grown 34% in the past five years, with an economic impact on the state of over $4.9 billion. Michigan has five official AVAs, all growing grapes within 25 miles of Lake Michigan. The lake provides a favorable cool climate, with an average of 145-day growing seasons in the northern AVAs and 160-day seasons in the south. Tip of the Mitt is the northernmost AVA, located literally at the tip of the state’s mitten-like shape. Established in 2016, it’s the youngest of the Michigan AVAs and produces primarily cold-hardy grapes such as Maréchal Foch and Léon Millot. 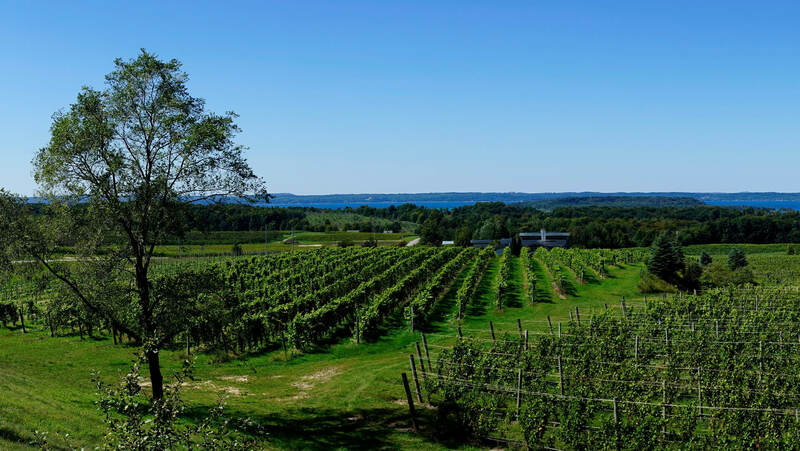 Slightly further south, the Leelanau Peninsula and Old Mission Peninsula AVAs are like the fingers at the top of the northwestern part of the mitten and account for more than 50% of the state’s production. Here, soils are well-drained, primarily glacial deposits that are a mix of morainic, alluvial, sandy, and pebbly composition. The Lake Michigan Shore and Fennville AVAs are in the southwest part of the state. Not surprisingly, this generally cool climate area succeeds best with white grapes. 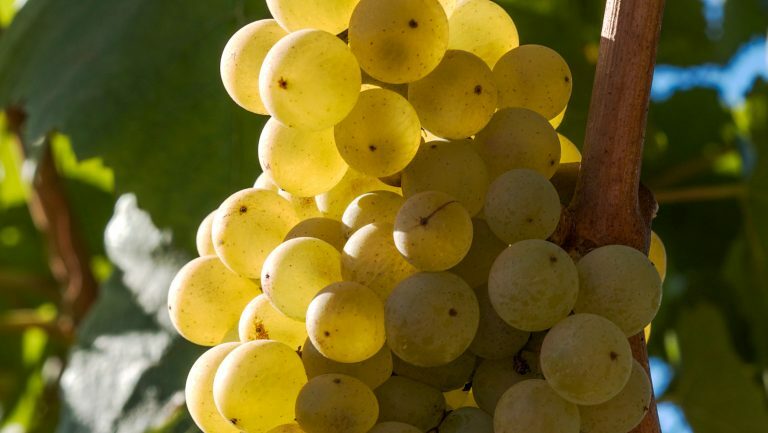 While Riesling is an obvious choice, varieties such as Pinot Grigio and Pinot Blanc are strongly suited as well, and struggle less to produced interesting, nuanced wines. Michael Descamps, Wine Director and Buyer for Red Wagon Wine Shoppe north of Detroit, notes that there has also been a trend toward elegant Pinot Noir, Cabernet Franc, and even Merlot in areas such as the Old Mission Peninsula. Descamps points to producers such as Old Mission Peninsula’s 2 Lads Winery for a variety of Riesling styles as well as Pinot Noir and Cabernet Franc, and newcomer Mari Vineyards for success with Cabernet Franc, Nebbiolo, and Sangiovese. On the Leelanau Peninsula, Big Little Wines is an up-and-comer producing pristine Pinot Gris and Sauvignon Blanc, while sparkling house L. Mawby has long championed Pinot Noir and Chardonnay for its méthode champenoise wines. Larry Mawby has been a Michigan wine pioneer since 1975, believing in the Leelanau Peninsula’s similarities to Champagne. His L. Mawby sparkling portfolio produces about 5,000 cases a year and is dedicated to traditional method sparkling wine from estate-grown grapes, while his second label, M. Lawrence, is a more whimsical line of wines made in the Charmat method. Michigan’s climate often offers early and late spring frosts as well as early fall frosts, curbing the growing season. In addition, moisture from the lake may put more mildew pressure on the plants, forcing a great deal of work in the vineyards throughout the growing season. For these reasons, Mawby had to be resourceful in narrowing down his grape selection. The M. Lawrence label produces closer to 17,000 cases a year, using both Michigan and out-of-state grapes, which allows Laing to be playful with grape selection. “We source some grapes from Washington or California but also use a wide selection from Michigan, including Riesling and hybrid grapes Traminette, Marquette, and Cayuga, which has acidity like razors and is perfect for sparkling wine,” he explains. In the southwest part of the state, near Indiana, James Lester of Wyncroft and Marland Wines has used his extensive study of cooler European regions to zero in on the slightly warmer microclimates of Fennville and Lake Michigan Shore. Here, Lester focuses on Bordeaux varieties, Pinot Noir, and Chardonnay. In many ways, the Great Lakes could be considered the Third Coast of the United States, as the region is sometimes called, in terms of similar soils, climate, and viticultural potential. The area’s moderate-to-cool climate that extends from Lake Michigan all the way to its eastern counterpart, New York. Lenn Thompson of The Cork Report, an online media outlet covering American wine regions, has been writing about New York wine for more than 15 years. According to him, while the gamut of grape varieties grown in the state is wide and varied, producers have more recently narrowed their focus significantly, in the industry’s favor. In terms of economic impact and overall wine production (including both vinifera and non-vinifera varieties), New York actually ranks third, ahead of Oregon. The state has more than 400 producers and nearly 12,000 acres under vine. It is home to 10 AVAs: Long Island, which includes two sub-AVAs, The Hamptons and North Fork of Long Island; Hudson River; Lake Erie; Niagara Escarpment; Champlain Valley of New York; and the Finger Lakes, which includes the Seneca Lake and Cayuga Lake sub-AVAs. While early New York wineries were established in the mid-1800s, it wasn’t until the 1960s and 70s that the state’s modern producers came on the scene, including Benmarl Winery and Cascade Mountain Winery in the Hudson River Region, and Bully Hill Vineyards and Dr. Konstantin Frank’s Vinifera Wine Cellars in the Finger Lakes. But according to the New York Wine and Grape Foundation, the real boom in New York wineries started with the Farm Winery Act of 1976, which made it more feasible to own and operate a winery producing fewer than 50,000 gallons per year. Today, the number of New York wineries has grown tenfold, with 391 of the state’s wineries established after the Farm Winery Act. Indeed, the state’s wine production has a significant geographic spread. But if you’re looking for the place where wine experts are zooming in to observe New York’s future, the Finger Lakes are where it’s at. The Finger Lakes are long, narrow glacial lakes that stretch north to south like fingers reaching up to Lake Ontario, known for deep waters that reach well below sea level. While the area experiences some extreme winters, it’s worth noting that the Finger Lakes AVA is often mischaracterized as cool climate. Though native and hybrid grapes shaped much of the Finger Lakes’ history (as well as that of the rest of New York) for much of the pre-Prohibition years, vinifera pioneers such as Dr. Konstantin Frank first tried their luck with cooler climate vinifera such as Chardonnay for sparkling wine and Riesling in the 1950s. While Chardonnay didn’t fare as well, Riesling is the region’s most successful variety. But there is a future for other grapes, too. 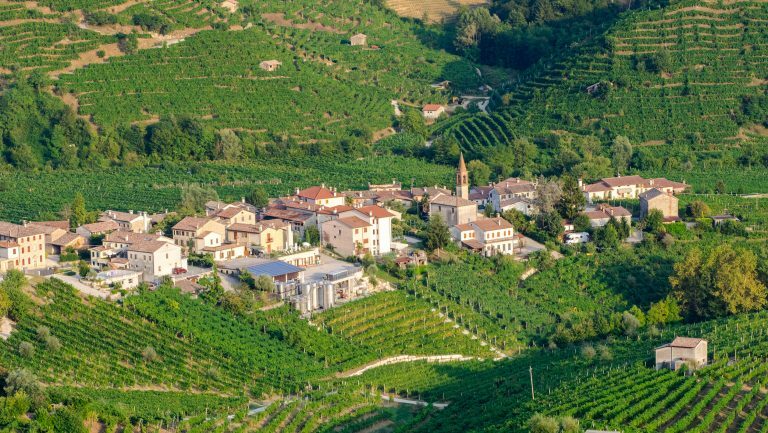 “You’ll find some incredible sparkling wine, as well as Gewurztraminer. The grape that has me the most excited, however, is Pinot Noir,” says Lenn Thompson. Christopher Bates adds, “Cabernet Franc has seen a lot of success in the region, but the Finger Lakes is way broader in potential than people realize. I’m also a big proponent of Syrah and Pinot Noir.” Indeed, Element Winery, which Bates started with his father in 2005, produces a handful of Rieslings as well as a selection of Chardonnay, Pinot Noir, Cabernet Franc, Syrah, Lemberger (Blaufränkisch), and Gamay. Another is selling wines for the right price. 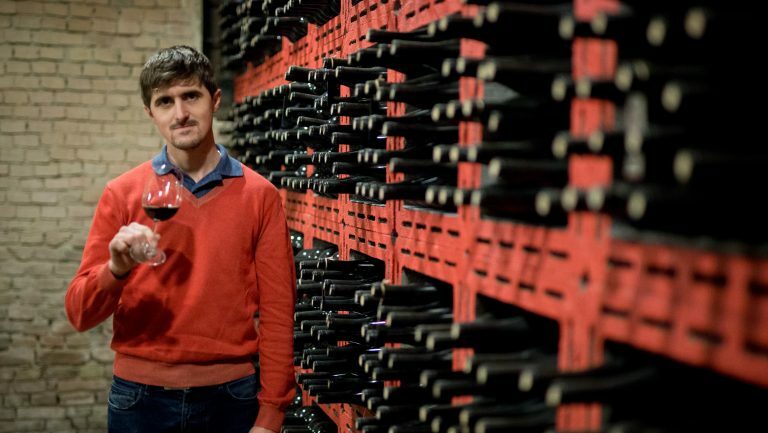 To Bates, quality wines should be priced to reflect the amount of effort it takes to produce them, a philosophy he thinks should also extend to the growing contingent of quality producers in the area. So far, this is a look at some of the larger wine-producing states, but what about the smaller states? Just as the flat, dusty High Plains of Texas may sound like a surprising place for wine production, so might the arid desert of Arizona. While this sunny state is most often associated with cactus-riddled vistas and images of the old West, in recent years, it’s been enlivened with the glimmer of excellent wine. Based on a report from the National Agricultural Statistics Service, Arizona has a little more than 100 producers and more than 1,000 acres of vineyards. Due to its variations in elevation, the state has a wide variety of localized climate conditions. In the lower elevations, the climate is primarily desert, with mild winters and extremely hot summers. The mountainous northern third of the state has significantly higher altitudes, offering an appreciably cooler climate with cold winters and mild summers. Sonoita, located about an hour south of Tucson, was Arizona’s first AVA. Once home to large cattle ranches, the plentiful rainfall and well-draining soils prompted several winegrowing pioneers to plant vineyards here in the 1970s. Willcox received its official AVA designation in 2016 and currently accounts for more than 70% of Arizona’s grapes. Though the Verde Valley is not an official AVA, its location in the northwest part of the state boasts high elevations and ideal growing conditions, with ample water from the Verde River and well-draining soils. According to Nikki Bagley of Arizona Vineyard Consulting, the uniqueness of Arizona is its ability to attain a wide diurnal temperature variation during the growing season. (The swings can be as large as 50°F in the summer months.) Almost all Arizona vineyards are situated within the areas that achieve this, and most of them at elevations of 3,500 to 5,500 feet above sea level. The state deals with an average 12.7-inch rainfall during two specific rainy seasons: Pacific Ocean cold fronts in the winter and a monsoon that pulls tropical moisture up from Mexico to make for a brief summer rainy season. This higher moisture and summer heat brings lightning, thunderstorms, wind, and torrential downpours. Like Texas and California, the history of Arizona wine dates to the 16th century, when Spanish missionaries planted grapevines for sacramental wine. The modern Arizona wine industry began in the early 1980s, following an experimental study from the University of Arizona. The first licensed wineries in Arizona arrived following the 1982 Arizona Farm Winery Act, which ushered in wineries such as Dr. Gordon Dutt’s Sonoita Vineyards, the first winery of this modern era. Throughout the 80s and early 90s, vineyards flourished through the southeastern part of the state. The late Al Buhl established the 40-acre Dos Cabezas Vineyard near Willcox, with Bordeaux, Italian, and Spanish varieties, including Malvasia, which has gained a great deal of attention in the state today. (The vineyard is now managed by Caduceus Cellars, while Buhl’s winemaker, Todd Bostock, took ownership of the Dos Cabezas Wineworks winery, located in Sonoita, in 2006.) While the industry remained small in the 90s, it experienced another burst of energy in the early 2000s, with plantings expanding beyond Sonoita and Willcox into the Verde Valley. “Lately, there’s been a critical mass of growers and winemakers who are pouring themselves into making great wine here,” says Bagley, pointing to leading producers like Maynard James Keenan of Caduceus Cellars, Joe Bechard of Chateau Tumbleweed, Rob Hammelman of Sand-Reckoner Vineyards, Kent Callaghan of Callaghan Vineyards, and Todd Bostock of Dos Cabezas Wineworks. Arizona’s soils vary by region, but Bagley likens them to European soils found in parts of Spain and France. “On a trip I took to Spain, I was amazed at similarities in Verde Valley and some of their alkaline-rich soils. In Southern Arizona, we have more sand, but both areas bring a lot of minerality to the wines. Willcox has interesting volcanic ash in their soil makeup that has made their wines really unique. In addition to Malvasia, some of the grapes proving most successful in Arizona include Vermentino, Picpoul Blanc, and Viognier. Syrah and Sangiovese have done well in Willcox, while Cabernet Franc and Zinfandel have joined Malvasia as key players in the Verde Valley. Todd Bostock has been encouraged by Petite Verdot, Graciano, Tempranillo, Tannat, Grenache (for rosé), and Aglianico. He’s also recently become excited about Kerner, Lagrein, and the Vranac grape. “We’re still experimenting based on what we’ve seen work in other countries with conditions similar to ours,” he explains. Like Texas, because of heat and varying degrees of dryness and humidity, Arizona winemakers have had to adjust not only their viticultural efforts but also their methods in the winery. These are fairly recent revelations. For the industry to grow in the right direction, Bostock and a handful of other producers—including Keenan (Caduceus Cellars), Callaghan (Callaghan Vineyards), and Hammelman (Sand-Reckoner Vineyards)—have formed the Arizona Vignerons Alliance (AVA) to help promote and set a standard for quality wine in Arizona. Producers across the state are invited to submit wines for evaluation and are added to the AVA’s list if they meet criteria. Key to the certification is that wines must be made in Arizona, using grapes grown within the state. Currently, 24 producers have approved wines. Indeed, when you look at the potential for the United States to grow world-class wine, the opportunity for growth is tremendously encouraging. It’s a topic that should compel American industry professionals scouring the ends of the earth to find the latest exciting wines to stop and consider what’s happening in our own backyard. As producers from California, New York, Michigan, Texas, Arizona, and everywhere in between continue to raise the bar for quality wine, time will tell how the rest of the American wine story will unfold.